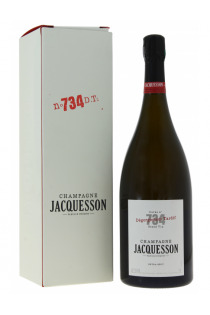 Jacquesson represents one of the few houses that have remained family owned. With 30 hectares in production Avize, Ay, Mareuil, Dizy and Hautvilliers, including ten hectares of purchased grapes, of only premier and grand crus. The Chiquet brothers aim their desire to achieve a high quality product. They continue to innovate, especially finding new and different versions of brut, excluding year (No. 735, 736 ...). Regarding vintage wines themselves, it is currently the vintages of 2002 that are in the spotlight.